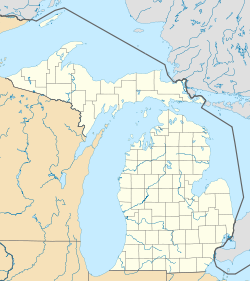 Iron River is a city in Iron County in the U.S. state of Michigan. 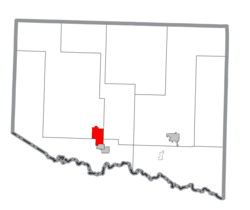 As of the 2010 census, the city population was 3,029. The city is situated at the southeast corner of Iron River Township, but is administratively autonomous. A post office called Iron River has been in operation since 1885. The city took its name from the nearby Iron River. On July 1, 2000, the city of Stambaugh and the village of Mineral Hills were consolidated with the City of Iron River. According to the United States Census Bureau, the city has a total area of 6.76 square miles (17.51 km2), of which 6.74 square miles (17.46 km2) is land and 0.02 square miles (0.05 km2) is water. The area is noted for its vast forest land, scenic lakes, and winter sports. As of the census of 2010, there were 3,029 people, 1,446 households, and 764 families residing in the city. The population density was 449.4 inhabitants per square mile (173.5/km2). There were 1,770 housing units at an average density of 262.6 per square mile (101.4/km2). The racial makeup of the city was 96.3% White, 0.2% African American, 1.2% Native American, 0.3% Asian, 0.1% Pacific Islander, 0.2% from other races, and 1.7% from two or more races. Hispanic or Latino of any race were 1.9% of the population. There were 1,446 households of which 22.5% had children under the age of 18 living with them, 36.7% were married couples living together, 12.3% had a female householder with no husband present, 3.8% had a male householder with no wife present, and 47.2% were non-families. 42.9% of all households were made up of individuals and 21.5% had someone living alone who was 65 years of age or older. The average household size was 2.02 and the average family size was 2.73. The median age in the city was 47.6 years. 19.6% of residents were under the age of 18; 6.8% were between the ages of 18 and 24; 20.4% were from 25 to 44; 28.5% were from 45 to 64; and 24.7% were 65 years of age or older. The gender makeup of the city was 47.0% male and 53.0% female. As of the census of 2000, there are 1,929 people, 876 households, and 487 families residing in the city. The population density is 555.7 per square mile (214.6/km²). There are 988 housing units at an average density of 284.6 per square mile (109.9/km²). The racial makeup of the city is 95.33% White, 0.16% African American, 1.92% Native American, 0.21% Asian, 0.05% from other races, and 2.33% from two or more races. 0.78% of the population are Hispanic or Latino of any race. 15.4% were of German, 13.4% Swedish, 13.2% Italian, 9.9% Polish, 7.8% English, 7.6% Finnish, 5.9% French and 5.1% Irish ancestry according to Census 2000. 98.3% spoke English as their first language. There are 876 households out of which 23.7% have children under the age of 18 living with them, 40.2% are married couples living together, 11.5% have a female householder with no husband present, and 44.4% are non-families. 40.3% of all households are made up of individuals and 23.7% have someone living alone who is 65 years of age or older. The average household size is 2.09 and the average family size is 2.80. In the city, the population is spread out with 21.3% under the age of 18, 6.2% from 18 to 24, 20.8% from 25 to 44, 21.7% from 45 to 64, and 30.0% who are 65 years of age or older. The median age is 47 years. For every 100 females, there are 81.5 males. For every 100 females age 18 and over, there are 80.2 males. The median income for a household in the city is $23,438, and the median income for a family is $33,942. Males have a median income of $28,083 versus $20,714 for females. The per capita income for the city is $15,728. 11.9% of the population and 6.5% of families are below the poverty line. Out of the total population, 12.5% of those under the age of 18 and 10.0% of those 65 and older are living below the poverty line. US 2 courses west to Ironwood and southeast to Crystal Falls and Iron Mountain. M-73 travels southwest to Wisconsin. M-189 runs near Caspian before continuing on to Wisconsin. This climatic region is typified by large seasonal temperature differences, with warm to hot (and often humid) summers and cold (sometimes severely cold) winters. According to the Köppen Climate Classification system, Iron River has a humid continental climate, abbreviated "Dfb" on climate maps. ^ "Iron County". Jim Forte Postal History. Retrieved 21 March 2015. ^ Chicago and North Western Railway Company (1908). A History of the Origin of the Place Names Connected with the Chicago & North Western and Chicago, St. Paul, Minneapolis & Omaha Railways. p. 86. ^ "ST. IGNACE-SAULT STE. MARIE-IRONWOOD" (PDF). Indian Trails. January 15, 2013. Archived from the original (PDF) on July 4, 2014. Retrieved 2013-02-28. This page was last edited on 3 January 2019, at 20:04 (UTC).